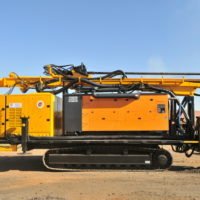 Smith Capital Equipment has been manufacturing Auger and DTH drill rigs for over 4 decades and our products include auger and down-the-hole rigs. 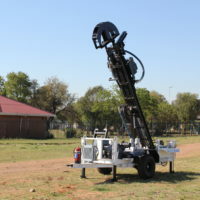 Typically these are mounted onto either trucks, tractors or crawler tracks, but we have successfully supplied customised rigs for many applications. 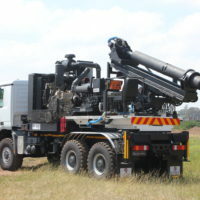 We are also recognised as a reputable supplier of reverse circulation drill rigs for exploration drilling in the African market. 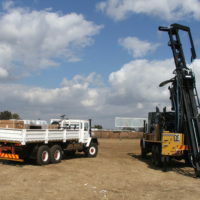 To complement our local Hotline™ range we also import the Terex Utilities range of digger derrick drills from the USA. 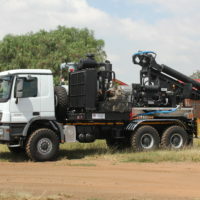 We have developed this drill rig especially for the utility supplier market. 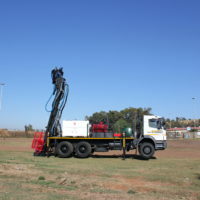 This DTH OBC (on-board compressor) unit has a unique rock drilling capability rig and is our flagship pole planting rig. 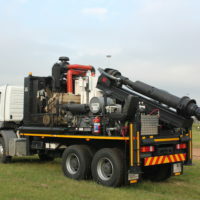 Our Triple H DTH OBC unit is capable of drilling with both percussion and auger and has proven to be a very productive powerline construction drill with total capacity and featuring accurate spotting (slew and slide), verticalising (rearward and side tilt) and long dump to the ground. 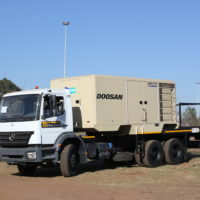 An on-board ELGI compressor is also fitted onto this same truck carrier to make it an all in one DTH system. 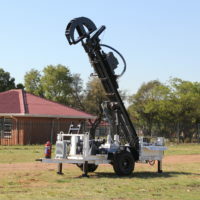 This DTH unit has a unique rock drilling capability and is very popular in South Africa. 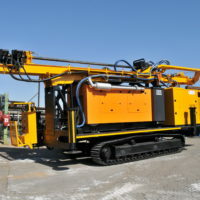 This down-the-hole (DTH) drilling rig is designed for percussion drilling in hard rock. 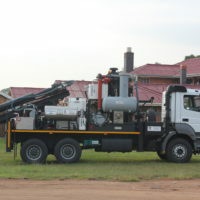 This drilling rig is fitted without a compressor on-board the same carrier. 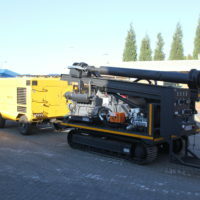 It requires a separate compressor to drive the hammer and bit combination. 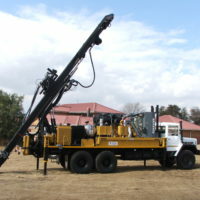 This drilling rig is designed for auger drilling in soft to general ground. 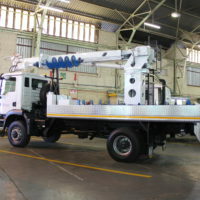 They are usually mounted onto 4×4 trucks but we have built them onto other carriers as required by our customers. 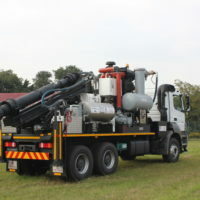 We have developed this drill rig especially for the utilities contractor market. 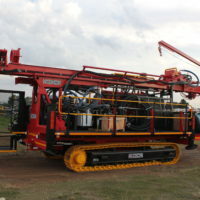 It offers the same reliability and performance as the proven Triple H, but lower cost to market to get you drilling as quickly as possible. 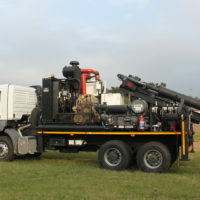 This DTH OBC (on-board compressor) rig is also capable of drilling with both percussion and auger and has proven to be a very productive powerline construction drill. 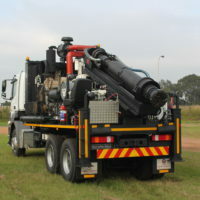 An on-board ELGI 14 bar compressor is also fitted onto this same truck carrier truck. We supply the market-leading Hotline™ Reverse Circulation rigs. 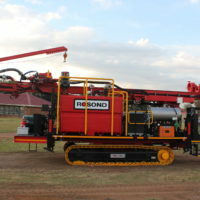 These drilling rigs are commonly used for exploration applications using RC air hammers and also for versatile grade control applications. 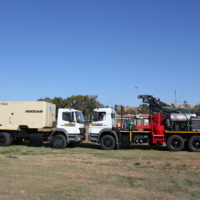 Our common drilling rigs are the 310RC, 510RC and 620RC units. 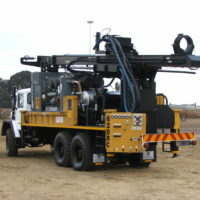 They are built to handle either 3m, 5m or 6m long Drilling Rods. 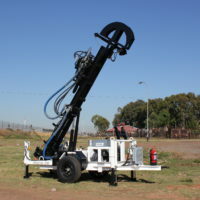 They have a pullback force of 10 ton or 20 ton with the hold back feature as standard. 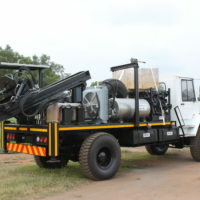 We mount these units on trailers, trucks or crawler tracks depending on the requirement. 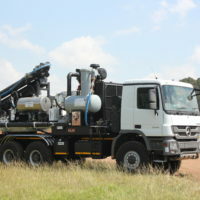 Our drilling rigs are plumbed standard for high pressure boosted air. Another unique feature is our Smith-designed RC Rotation gearbox, which incorporates a floating shaft that assists in minimising rod thread damage encountered during make up and break up operations. Our head also incorporates a long sacrificial inner tube for simplicity and to minimise air leakage and wear through the head components. 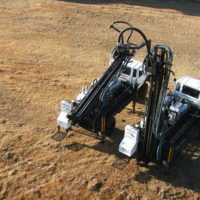 Smith Capital Equipment has been manufacturing Auger and DTH drill rigs for over 4 decades and our products include augering and down-the-hole rigs. 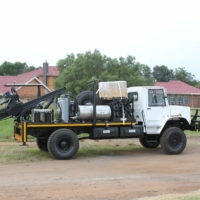 Typically these are mounted onto trucks, tractors or crawler tracks, but we have successfully supplied customised rigs for many applications. 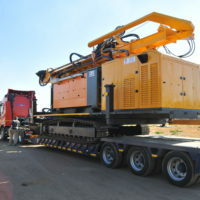 We are also recognised as a reputable supplier of reverse circulation drill rigs in the African market. 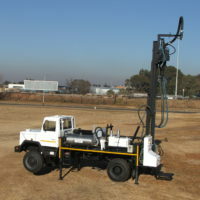 To complement our local Hotline™ range we also import the Terex Utilities range of digger derrick drills from the USA. 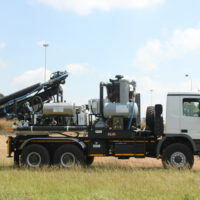 Our range of Hotline™ waterwell equipment is designed for simplicity, and covers every size, style and carrier. This allows us to tailor the product to your specific need. 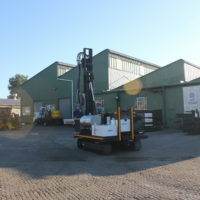 We are able to spec the right equipment for your job, with size, separation and simplicity in mind. 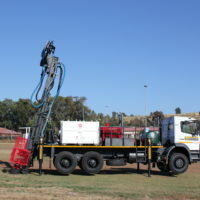 We sell drilling solutions which will ensure maximum profitability with the least amount of required capital and running costs. The Hotline™ rigs are built in Africa for African conditions, ensuring less maintenance and more ease of use even in remote areas.